I love it when I come across an amazing recipe by accident. On the way to the grocery store last night I Googled “Hash Brown Casserole” and several results came up, but the one that caught my eye was Paula Deen’s recipe on foodnetwork.com. I immediately decided I would go home to create it and boy was it a good decision. This hash brown casserole is the best breakfast casserole I have ever put in my mouth. The picture doesn’t do it justice. 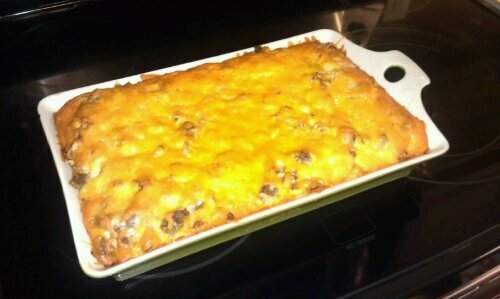 I made it with hot sausage, fresh italian bread and freshly grated parmesan and sharp cheddar cheeses. It’s not your average hash brown casserole…it’s more like french toast meets eggs and sausage and everything you need in one dish. It puffs up beautifully when it’s baking and the cheese turns to a perfect golden brown. It was so good, I’ve decided to make it again on Christmas morning. It’s one of those recipes you can assemble the night before and bake the next morning. Serve it with some fresh fruit and you’ve got a breakfast that won’t leave you hungry. Next Blackberry Cobbler and No Vanilla Ice Cream? What a Tragedy! !